Today is the 20 year anniversary of the O.J. Simpson trial. The newscasters were talking about it on CNN. They were entertaining the question of OJ’s guilt or innocence, and interviewing each other and assorted “experts” on the subject. So, you ask…what do you think? Did he kill his wife? Or not? I have NO idea…no opinion. I wasn’t paying much attention at the time of the trial, although I was tuned in when the verdict was read. OJ was of course waiting breathlessly…after all, his future depended largely on the decision of the jury…the suspense was heavy and thick. The foreman read the verdict: NOT GUILTY. I can still see the look on Simpson’s face. What were his emotions? Shock, Relief, Surprise, Joy…the reactions of a man who had just gotten his life back. The point is this. The issue here is not the basketball great’s culpability in the death of his wife, his guilt or innocence, the big question of if justice was served or was a gross miscarriage. The actual point is moot…the trial was held and a duly seated jury made a verdict, which the Judge upheld, and the case was closed. What happened was that the entire procedure of the O.J. Simpson trial was what is called the Law of the Land, the exercise of the basic right of all Americans to be guaranteed a Trial by a Jury of his or her Peers. That jury heard the evidence and charges presented by the State, and by Simpson’s own attorneys–and made their decision. The Jury acquitted O.J. Simpson of murder charges. None of that matters, really, because the fact remains that the Simpson trial was conducted by the Law of the Land…whatever we as individuals believe is immaterial, because the Jury verdict was reached according to the rules of the system. The system exists as it is set up. We can’t have it both ways–either the Rule of Law as it pertains to the right to be presumed innocent until proven guilty prevails for all people–or it does not. So since the Jury said “Not Guilty,” the defendant was freed as acquitted. The only opinions that matter are those of the Jury. They did WHAT to Bubblewrap? Some things just should never change. Like bubblewrap, the impossibly satisfying packing material that is used to protect all sorts of products…from computer components to special delicacies like chocolates or fragile cookies…during shipping from factory to consumer. For anyone who has been marooned on Mars for a couple of decades, bubblewrap is made of two sheets of clear (or colored) thin plastic, pressed similar to a waffle to trap air within small bubbles–which is what gives bubblewrap its strength, and its name. It does sound sort of silly, but bubblewrap has proven to be effective in its capacity for protection of items during shipping. Well, now they have decided to…take out the bubbles! For bubblewrap’s successor, I envision some variation of that plastic-foam stuff, that may be as strong, cheaper to make, and possibly less complicated to make. Even so, the foam sheet is boring; it doesn’t make noise, reflect light, or offer any residual benefit to its original purpose. 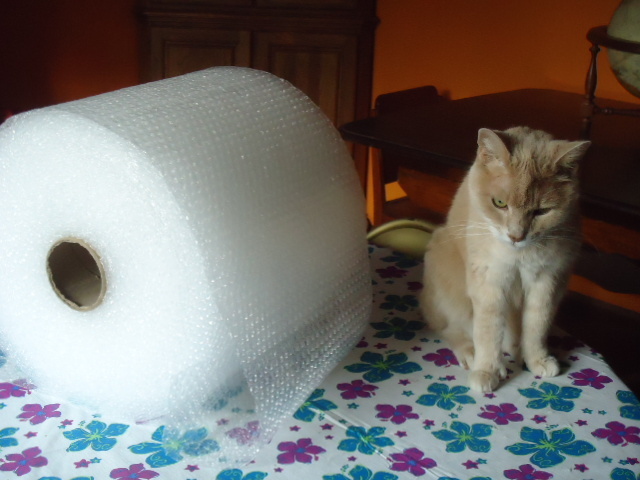 Perhaps the best thing about bubblewrap is its inherent entertainment value. Bubbles are for popping…and for some reason the rapid staccato popping sound is a free-bonus to a recipient of something that comes wrapped in bubblewrap. Show me a person of any age that can resist squeezing the individual bubbles to hear the sound they make…not unlike fire-crackers.